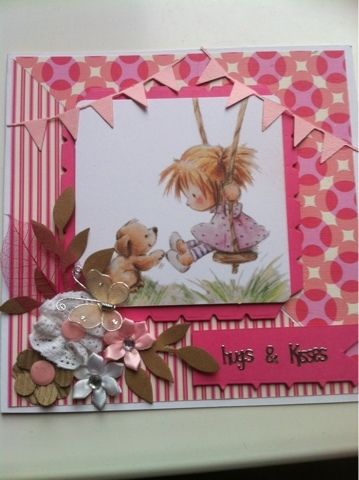 Lyn this card is beautiful & fits the prompt exactly, loving how you did those flowers! What a pretty card Lyn. Lots of lovely details and particularly love the flags. Thanks for joining in the Cupboard Trilogy Challenge. Hi Hun it is lovely to see you blogging again. I just adore this lovely card. Have you checked out Jak's blog lately I think you won something in her blog candy giveaway. Such a pretty card Lyn and such a pretty stamp! Love how you've coloured it too! What an absolutely lovely card :-) the image is adorable, the embellishments are gorgeous! Lyn this is wonderful and anyone who received this would be over the moon! Your colouring is great Lyn and the image is soooo cute!! Love the bunting and those flowers are delish!! Good to see you blogging again! !